Normally if you’re eager to make a quick getaway, you pick a motorized vehicle as your mode of transportation. Not John Wick. Somehow events in his third theatrical adventure will lead to him hopping on a horse and weaving through New York traffic to avoid the foes pursuing him on motorcycles. Judging by that gash on his head, John’s been freshly injured, so he’ll need to hightail it out of there before anything worse happens. And the insanity doesn’t end there. 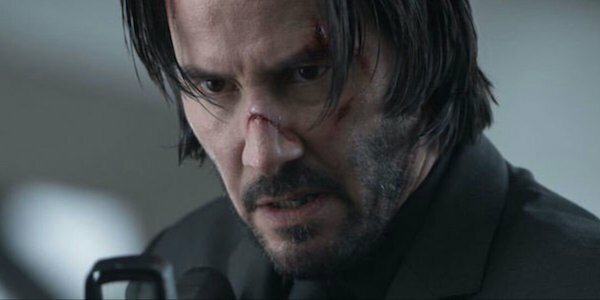 Director Chad Stahelski also told Empire that the “maelstrom” around John Wick 3: Parabellum‘s central character will include “horses, dogs, cats, a raven, a bunch of pigeons, a motorcycle chase, car chase, Halle Berry, Laurence Fishburne, Ian McShane, Lance Reddick, shotguns and ninjas.” Some of those are to expected, like Fishburne, McShane and Reddick all reprising their respective roles, but ninjas?! Even by John Wick standards, that’s nuts, and now I’m wondering if these are your standard black-garbed ninjas with throwing stars, or if these ninjas will be wielding the shotguns.